Using up all my backyard veggies has been so much fun this year! So far I’ve whipped up a show stopping garden veggie tortellini salad, the most scrumptious chickpea salad sandwich, tomato panzanella for days, and enough leafy green salads to keep green in business. I’m going to go ahead and say it: the food is my favorite part of Summer! Summertime… and the living is tasty. 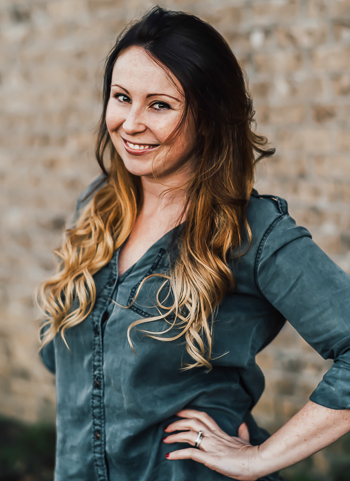 The posts are shorter, recipes are quicker, and my pint-sized assistant is here to partake in every single one of my food photography shoot dance sessions. Turn up the music and join us! Also, you’ve GOT to make this recipe. 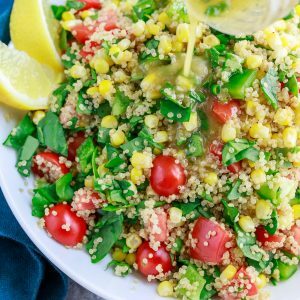 This colorful salad is totally tasty and loaded with corn, spinach, peppers, basil, tomatoes, and quinoa galore. Raid your garden, hit up the farmer’s market, empty the crisper… whatever you have to do to get this scrumptious Summer salad in your face! It’s great as a side dish with dinner, makes a stellar portable lunch (as a side to pair with protein or as a main vegetarian dish!) and is also great for picnics and parties. Enjoy! First rinse and drain your quinoa using a mesh strainer or sieve. Bring a medium saucepan to medium heat and lightly toast the quinoa to remove any excess water. Stir as it toasts for just a few minutes. This step is optional but really adds to the nuttiness and fluff factor of the quinoa! Next add your water, set burner to high, and bring to a boil. Once boiling, reduce heat to low and simmer, covered with the lid slightly ajar, for 12-13 minutes or until quinoa is fluffy and the liquid has been absorbed. While the quinoa cooks, whisk together your dressing ingredients and set aside for flavors to mingle. Next prep your veggies! Cut your corn from the cobb and saute or steam to cook. Alternatively drain/rinse if using canned or steam if using frozen corn. Chop spinach, bell pepper, and tomato. Feel free to use fresh, canned, or frozen corn for this recipe! No basil? No problem! Use extra chopped green onion/scallion or even some red onion to amp up the flavors of this fresh veggie salad. Season to taste and dive on in! No avocado oil? Feel free to use a light olive oil or grapeseed oil. Feeling cheesy? Add some crumbled feta to the mix! Nutrition facts below are an estimate provided by an online nutrition calculator. Recipe yields 6 side-salad sized servings. so . . . how is it?! 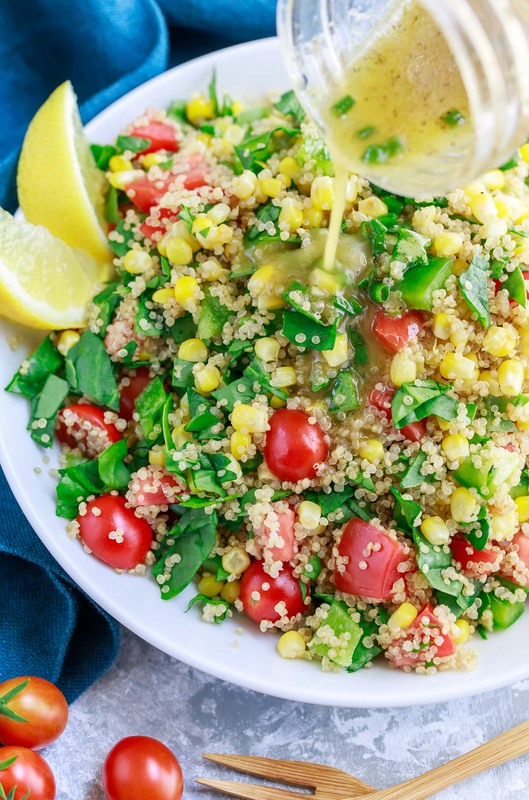 This super simple salad is flavorful and refreshing, plus it has fantastic texture from the combination of both tender, juicy, and crisp veggies with fluffy quinoa coating every bite. Love it so! I didn’t have any handy, but freshly blanched asparagus would be a delicious addition to this salad. Crumbled feta would be great too as would chickpeas. Let your tastebuds be your guide and have fun with it! We paired this speedy salad with some BBQ chicken. It would also be amazing alongside your favorite burger or veggie burger or some grilled or sautéed shrimp. Serve it up at your next backyard party or potluck for a healthy side dish that’s so easy to make! 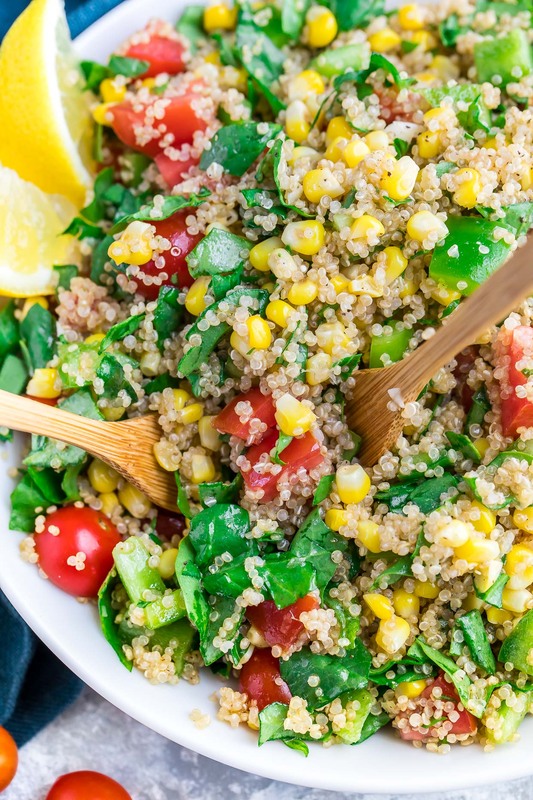 I can’t wait for you to try this garden veggie quinoa salad! Thanks Cindy – we loooooove it! I make it in advance all the time and just keep the dressing separate until the following day. Mix, serve, faceplant! I love having my mini-me’s home for the summer too. It’s hard fitting everything in though in between all the family time and I’ve yet to master the art of shorter posts. However, I’m loving this salad. It is so vibrant and looks pretty speedy to prepare. Thanks Jane! It’s a juggling act in the Summer for sure – I kind of just stopped writing/photographing at one point and I’ve just been holding out for mid-August! Thank you Nichi! Happy to share! I love this so much!!! I need to cook more with quinoa!